It used to be that food trucks were a place to get a dollar slice or a $2 taco. But in the past few years trucks have had a pricey gourmet makeover, and now offer everything from a $9 burger to a $17 crab roll. "There's so many options, and there's organic good food, and it's great. But ... the portions are kinda small and it's kind of ridiculous to charge eight bucks for just two tiny tacos," said Carolyn Bahar, a design intern living in New York City, about a visit to Smorgasburg, a weekend flea market for foodies in the Williamsburg section of Brooklyn. Even though some of the Smorgasburg offerings were a bit pricey, that hasn't deterred Bahar. "It kind of comes with the scene," she said. "You have to expect it." Ice cream sandwiches from Coolhaus food truck. An ice cream sandwich at Coolhaus, which has 11 trucks nationwide, starts at $6, compared with about $2 for a 12-pack at Wegmans grocery store. Coolhaus features high-quality ingredients and unique flavor combinations such as pistachio-black truffle ice cream sandwiched between red velvet cake cookies. 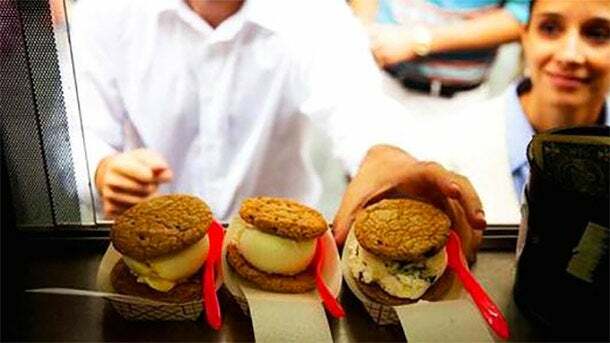 "In the end, it's not like our sandwiches are the cost of going on a big vacation, it's only a few dollars more for a high-quality product; I think it's worth it, personally," said Natasha Case, CEO and co-founder of Coolhaus. The food truck industry exploded in recent years. The number of trucks roughly doubled between 2007 and 2012 and annual revenue soared to $716.2 million from $339.7 million during that period. The main reason? The economy. "Around when the recession was happening, products went from hot dog stands and those more simple things to more gourmet mobile vendors," said Andy Brennan, a market analyst for IBISWorld. And it makes sense, if you think about it: Consumer wallets were tightening, and getting gourmet fare from a truck was a more affordable option than at a restaurant, which provided an incentive to shift spending, Brennan explained. For truck owners, it was a great deal--rent and other overhead costs were a lot less expensive than a restaurant. Many owners saved on labor costs by doing the cooking themselves. But as competition increased, so did prices. 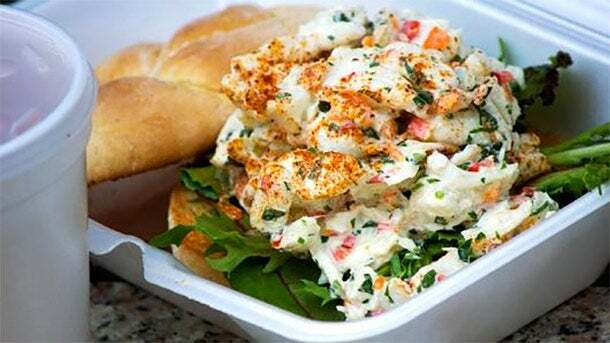 A crab salad sandwich from Feelin' Crabby. Image credit: Alex Tsamouras, owner of the Feelin' Crabby food truck. "There's definitely been a lot of product innovation, as far as people are introducing a lot more higher-price items," said Brennan. "Food trucks are becoming more and more gourmet, and that's a broad trend throughout the whole food service industry." Alex Tsamouras owns Feelin' Crabby, a Washington, D.C., food truck that serves crab and lobster-centric sandwiches, salads and sliders ranging from $11 to $18. He said that rising consumer perspectives on food trucks have allowed his business, despite its price tags, to thrive. "One of our sandwiches is $17, but people view us almost as restaurants now and they find it more convenient, so they'll still buy it. They know they're getting the same food, it's just a different way of getting it," he said. Tsamouras was classically trained in culinary school and worked in multiple restaurants before opening his truck. "I think there will always be a huge variety of food trucks and price points, and I think there are different levels of food classes in them," he continued. "That variety will keep people coming back to the trucks." Part of food-truck pricing, though, is hidden to most consumers' eyes. While overhead and many other costs are lower for running a truck compared with a restaurant, parking and regulatory costs have crept up on trucks and increased competition has squeezed individual revenue. Inadequate storage facilities and high-quality ingredients then compound that problem. "To make a profit, they all have to charge quite high prices. While a restaurant has high start-up costs, they earn all day; a food truck has only peak hours," Brennan said. One of the dishes offered from the The Mac Mart food truck. The Mac Mart food truck in Philadelphia hasn't quite followed the haute steps of others. 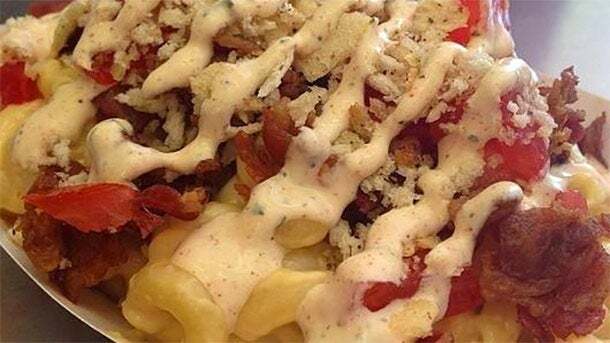 It still offers a hefty 16-ounce "B.R.A.T.Mac," a cheesy dish complete with crispy bacon, tomatoes, panko bread crumbs and homemade ranch drizzle, for $8. "I think the reason I have those return customers is because, at $8, my customers know that they're getting their full money's worth. I certainly don't want my customers to feel like they're getting taken advantage of," said Marti Lieberman, Mac Mart's owner. "I really like to make them feel like they're getting value." Philip Shen, Kim Pham and Terri Phillips of the Behind the Food Carts blog say they aren't bothered by high prices. "As food lovers, we're always willing to pay for food, and with trucks in general I don't think you're paying through the roof like you would in a similar restaurant," said Shen. "I think if you like to eat something, you're willing to pay for it." Despite the rapid growth spurt, some industry analysts see a slowdown ahead for the food truck business. Revenue is expected to slow to a 4.2 percent annual growth rate for the next five years after averaging 12.5 percent in the past five, according to IBISWorld. Many trucks already feel the tides, and are looking beyond their mobile operations to bigger business strategies like teaming up with retailers and opening brick-and-mortar locations. "I will say that it is very hard for a truck to survive when it's just one truck and that's it--that's very challenging," said Case, whose Coolhaus, in addition to having multiple trucks, also sells its products in Whole Foods and Fairway, among others. "A truck is best as a strategy that goes into a bigger strategy, and oftentimes trucks are launching points to brick-and-mortars and to take a product to packaged distribution." Lieberman, however, does not envision a brick-and-mortar store in her near future, nor is it a short-term goal. "I definitely would like to open my truck at college campuses around the country, and maybe package stuff for delivery for other states, but it's kind of open right now. I definitely don't want to be in a truck for the rest of my life," Lieberman said.